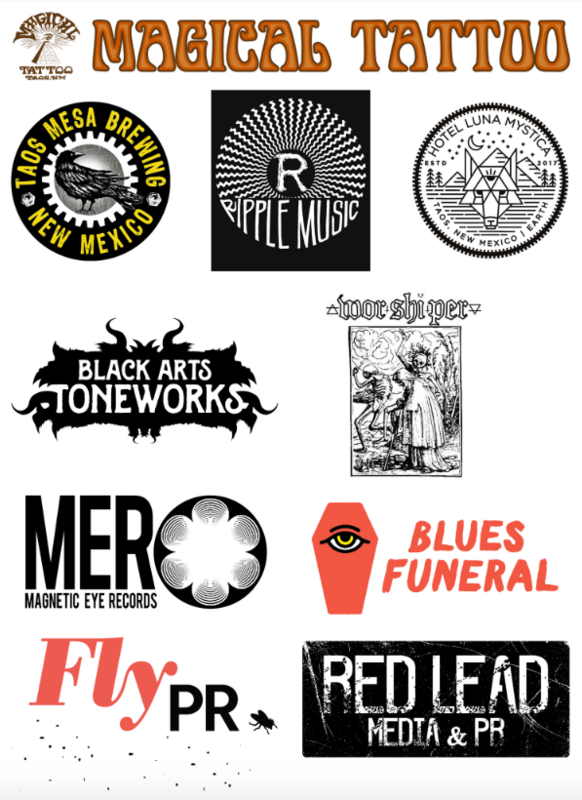 March 26, 2019 (Taos, New Mexico) – Monolith on the Mesa is proud to announce the inaugural year of the two day music and interactive art festival taking place May 17 – 18 at Taos Mesa Brewing (The Mothership and Taos Tap Room). A pre-festival party and concert is taking place May 16th in the same location. Venue opens daily at 11 am and the headliner's set ends at midnight both evenings. 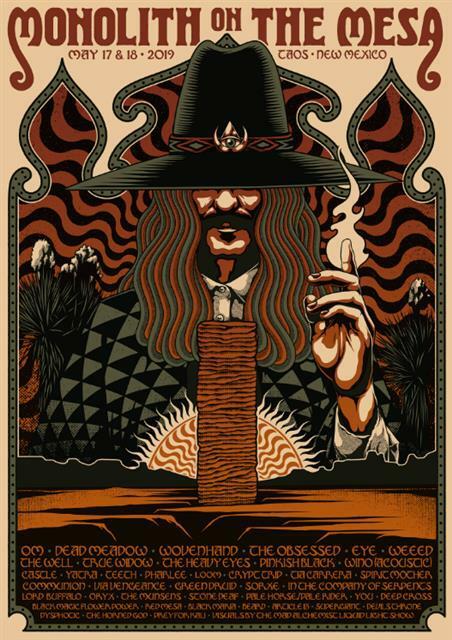 The line-up is focused on heavy riff-rock acts from across multiple sub-genres including stoner rock, heavy psych, doom metal, sludge, drone, and retro rock. The interactive art installations and visual projections throughout the festival grounds compliment the mind bending sounds these artists create. The festival is billed as "a truly singular and mystical experience. A weekend of live music heaviness blasting onto the high desert mesa in full view of the Sangre de Christo mountains." "Music is the universal language, and as emotion's companion invokes thought, feeling and awareness" Saturday night's headliner Wino of The Obsessed muses. "We are excited and honored to be invited to perform at this gathering, and we hope to see a lot of friends, fans and family out in the gorgeous environs of Taos, New Mexico." Lisa Bella Donna of EYE adds “We are truly looking forward to being a part of Monolith on the Mesa. Since improvisation is a big part of the overall picture EYE paints with our music, we’re very inspired to take everything in while we’re there, and to circulate that momentum." Interactive art installations by Christian Ristrow and Christina Sporrong of Robochrist industries will be on display and JP Rodman, an innovator in the bike builder world, will be exhibiting custom bike builds that are unrivaled in the world. Once the sun sets the Mad Alchemist Liquid Light Show will illuminate the open air amphitheatre with an astounding 21st century light show. "This location is highly unique and vastly different than anyplace else I've ever witnessed live music," enthuses Monolith on the Mesa festival founder and curator Dano Sanchez. "Our location at the base of the mountains and at the edge of the Rio Grande gorge sets our festival apart. Taos Mesa Brewing is a far out venue. From the Taos Pueblo to the Gorge Bridge we've got amazing activities in the vicinity like rafting, hiking in the desert or in the mountains, mountain biking, soaking in the natural hot springs, not to mention visiting all the cool establishments in Taos. It is truly a magical place and combined with awesome music and art it’s going to be like no other music festival around today." The festival features an indoor stage (400 people capacity) and an outdoor “earthship” amphitheatre which holds 1,500 people. This allows an intimate experience for guests and performers. Music will begin daily at 11:30 am and will alternate between the indoor and outdoor stages. Hotel Luna Mystica is located adjacent to the venue and offers guests camping and the exclusive “Monolith Experience” in the form of a custom, vintage trailer park. Vendors can be found on both properties and will include artisans, record labels, food trucks and more. Box office opens at 9 am Friday and Saturday. Venue doors open to the public at 11 am Friday and Saturday. May 16th: Pre-party Show ticket at $25 HERE. May 17-18 Two Day Pass at $125 HERE. May 17-18 Two Day Pass with camping access at $155 HERE. May 17th (Day One) Single Day Pass at $70 HERE. May 18th (Day Two) Single Day Pass at $70 HERE. Sponsorship opportunities are available to companies and organizations that share the festivals outlook on music and consciousness. Magical Tattoo-Taos, New Mexico’s premier tattoo shop. Black Arts Toneworks-Amp Smashers Union: Handbuilt Electric Guitar/Bass/Keyboard distortion/boost and fuzz pedals. Worshiper Cabinets: blood, sweat, volume. Hotel Luna Mystica: vintage trailer and starlight campground. El Monte Sagrado: Northern New Mexico’s most exclusive luxury resort. For press materials or additional information on Monolith on the Mesa please contact Fly PR: T. (323) 667-1344 or info@flypr.net.